I know what you're thinking, Sarah, how on earth are you qualified to write for approximately seven days on living in a small space? Well, I'm so glad you asked. My house is pretty small. When I tell people we have a small house they generally inquire about the square footage. When I tell them, 784 square feet, they say, oh! That is small. (The average home in the U.S. is approx. 2,000 sq. ft.). To be fair, we do have a finished detached garage, which adds some square footage, but it's not much. Living in a small space can be a challenge, but I really do love it. For the next week (or so ...) I plan to take you through each room of my petite domicile and talk about the high points and the challenges involved with these small spaces. 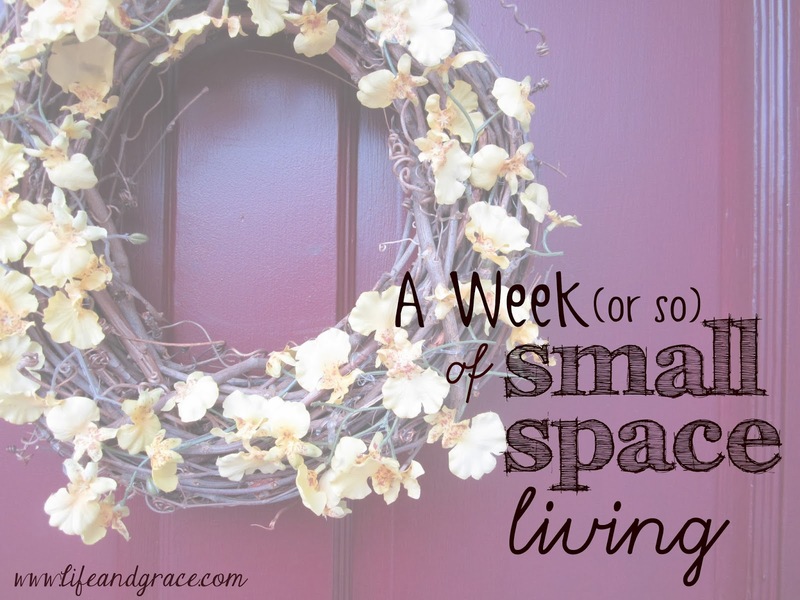 I'll give some tips about how we make it work and, above all, communicate how I think living in a small home keeps us more content and our needs prioritized. So I hope you'll be back and I look forward to sharing my home with you. Looking forward to this series! I guess we have a smaller than average house too, but not as small as yours. ;-) We committed to living within our space years ago, so if it doesn't fit in our house, we get rid of it. We don't have storage in the basement or attic. perfect! Can't wait to see what you share! I love ideas for how to fit in small spaces - always looking for inspiration, even though currently I'm a little less cramped than I've been used to in the past. I definitely won't complain for more space, haha! I feel like our Norfolk house had very little wasted space and we made very good use of the space we had (taking down walls and such), not perfect maybe, but pretty close:-) Can't wait to see your posts! Excited to read this series! We were in small spaces for a long time and I kind of loved it.